Long Island, often said to be the most scenic of all the Bahamian islands, is 80 miles (129km) long and four miles (6km) across at its widest point. Like most Bahamian islands, Long Island provides opportunities for visitors to swim, sail, snorkel, scuba dive, free dive, and engage in any number of watersports activities or seaside relaxations. One of the main events on the Bahamas yachting calendar is the Long Island Regatta, which takes place in the town of Salt Pond each May, drawing visitors from all around the world to one of the most beautiful and unspoilt islands in the Bahamas. The locals of Long Island still depend on fishing for their livelihood, while visitors revel in the shallow bays and white beaches of the western shore. The rugged windward coast features towering cliffs washed by wild waves. There are also some renowned offshore diving and snorkelling spots, and a spectacular view from the northern tip of the island at the site of a monument to Christopher Columbus, who enjoyed the vista when he came ashore in 1492. 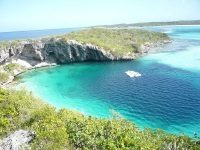 The island is home to the deepest blue hole in the world, just north of Clarence Town, called Dean's Blue Hole. The world free diving record has been set in Dean's Blue Hole, and the free diving world championship is held there.